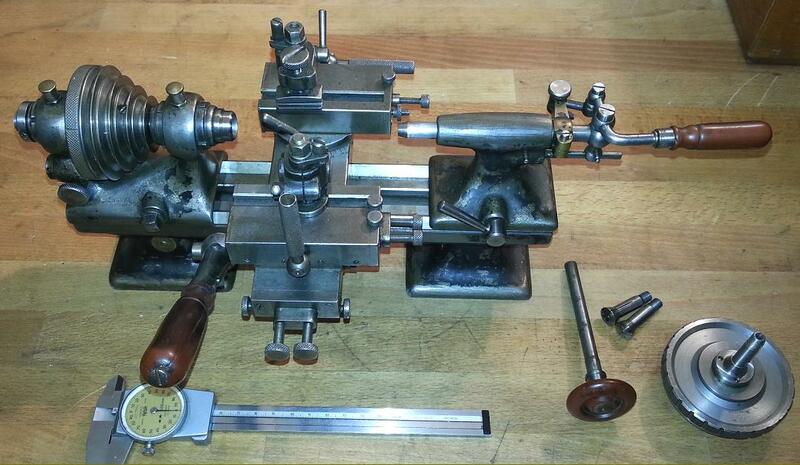 Better known as makers of machine tools branded "Sixis", the little bench precision lathe was made by G.Perrenoud et Fils based in S.A.-2520 LaNeuveville - the traditional heart of the Swiss watchmaking industry. 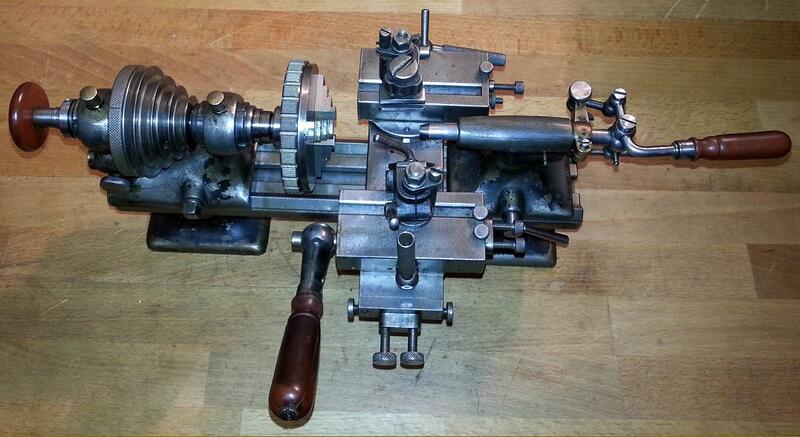 Obviously an early example and probably built circa 1910 to 1920, the lathe carries G.Perrenoud markings and not Sixis, the point at which the change from one to the other took place being unknown. As set up the lathe would have been intended for production work, the cross slide carrying unusual, short travel, swivelling, front and rear tool posts equipped with height-adjustable tool holders - the whole assembly being designed to facilitate the rapid set-up of jobs. Control of all movements, including that of the tailstock spindle, was by lever with screw stops fitted to limit both for and aft travel.. Unlike the majority of bench precision lathes whose beds had a flat top and bevelled edges, the G.Perrenoud had, like the American Sloan and Chace a distinctively different arrangement with two symmetrical V-ways. Although it has not been dismantled to check, it's likely that the headstock spindle would have been made from what was once referred to as "from ball-bearing" steel, this being hardened and ground both internally and externally and running in plain, hardened steel bearings - the arrangement being the very best that the technology of the day could provide - and one that stood the test of time, with many lathes so equipped (from a number of makers), clocking up tens of thousands of hours of arduous service at high rpm without showing any signs of wear. In the tradition of precision bench-lathes the headstock pulley was arranged with its smallest diameter towards the spindle thread so the all-important front bearing could be surrounded with as great a mass of metal as possible. Collets were secured by a simple draw tube, the perhaps being too early to have had a lever-action collet closer. 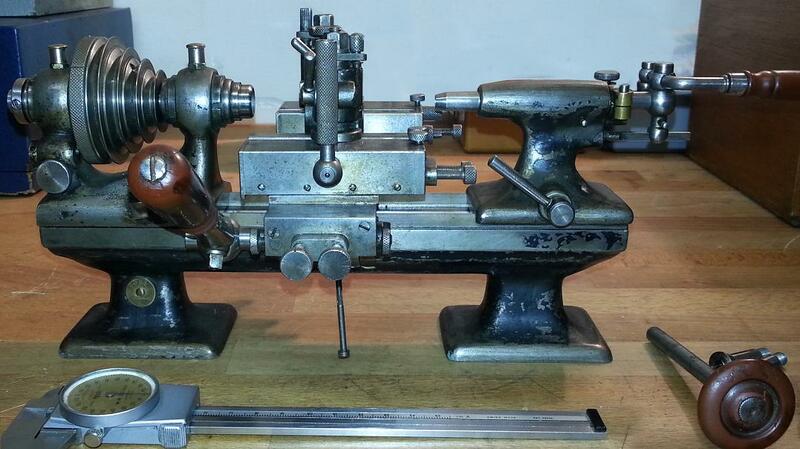 Lathes of this simple but beautifully-made class were, at one time, an important part of production shops, toolrooms and those shops that dealt with the manufacture, repair and maintenance of instruments, clocks, watches and other finely-made mechanical parts. Like other European and American makers of similar high-class machines it's possible that the G.Perrenoud might have been adaptable for use in three distinct roles common to the type: toolmaker, second-operation and production capstan. 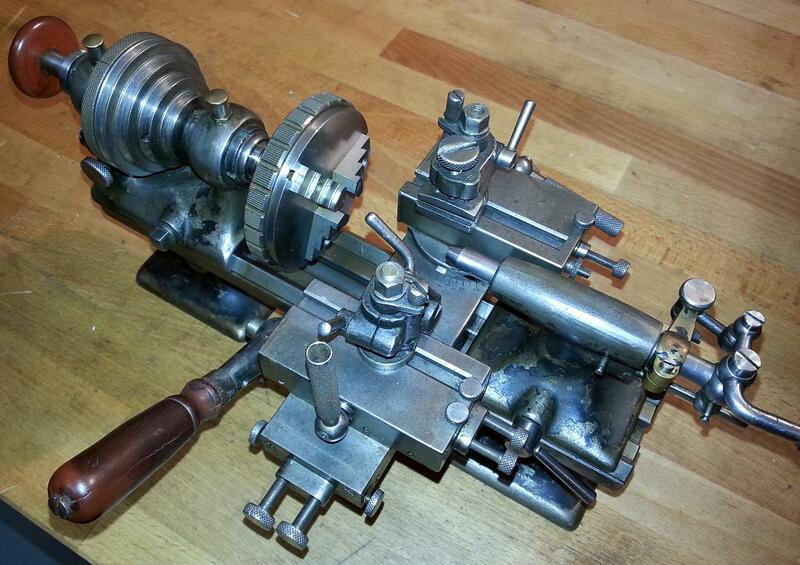 The toolmaker's type, intended for one-off precision jobs by a skilled turner, would have been equipped with a screw-feed compound slide and tailstock while the second-operation version (sometimes called a "finishing lathe") had a choice of screw or quick-action lever-operated slides while the production model would have mounted a 6-station capstan unit and a lever or screw-operated cut-off slide. By the simple means of changing the fittings bolted to the bed, each version could be assembled in a matter of minutes and pressed into service with a minimum loss of time. 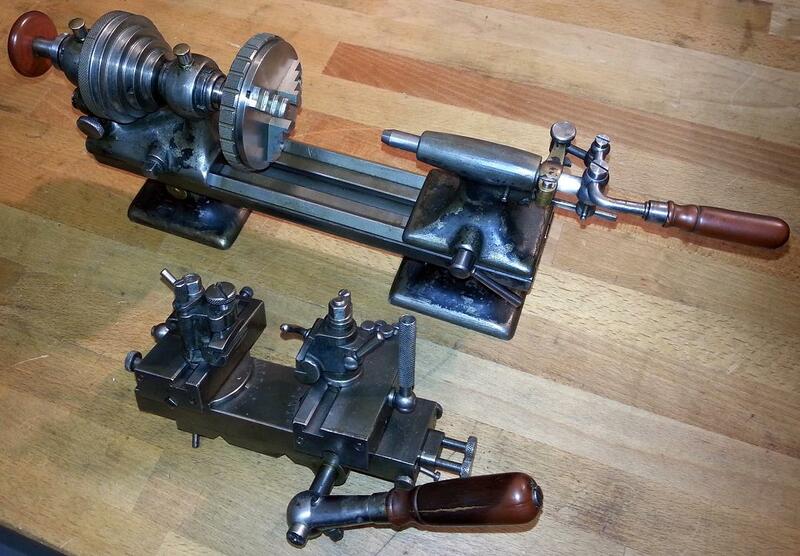 If you have a lathe or specialist machine tool marked G.Perrenoud, the writer would be interested to hear from you.